Is Your Garage Door Safe? Contact Our Experts For Maintenance & Safety Checks! 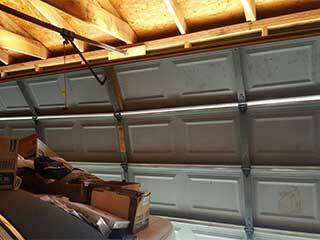 Problems affecting your automatic garage door system can be incredibly annoying and potentially very dangerous as well. To make sure you avoid as many issues as you can, some regular maintenance is needed. The service appointments our team provides will help you in many ways. We'll keep your springs in great shape, ensure your opener is safe for you to use, and see to it that no part of the mechanism is developing an issue that could grow into a full-blown malfunction anytime soon. Our technicians will run some tests on your garage door opener in order to make sure that its safety-ensuring mechanisms are all fully functional. We'll make sure the photo eye sensors are properly aligned with each other, and we'll test the functionality of the auto-reveres feature to ensure the door will reverse when an obstacle gets in its way. In order to keep your door balanced, the tension of the springs may need to be adjusted periodically. Because these hardworking components are under constant stress, they will start to weaken over time, which could cause them to lose some of their tension. Our experts will test the balance of your door, adjust the tension of the springs safely, and then lubricate them to ensure their smooth and silent operation. There are other parts of your door system that can really benefit from it. Mainly, all the moving metal parts, like the rollers and the hinges. We will also lubricate them, examining their condition in the process to look for any minor damage or rust. We will also check the tracks for bending and for misalignment, and repair any small dents we find on the spot. Instead of simply waiting for your door to break down due to a preventable problem, contact our team at Garage Door Repair Forney and let our experts make sure you avoid as many malfunctions as possible. Our team has the skill and experience needed to handle any garage door related problem. Whether your opener is malfunctioning, your springs are wearing out or you need a new door, we can help. Get in touch with us today to arrange an appointment, or have a look around our site to find out more about our services! Our technician will contact you before arriving. Until then, feel free to browse our website! Garage Door Repair Forney is at your service!